But Johnson said he is “not declaring mission accomplished” yet and pointed to the fiscal 2016 budget request for Customs and Border Protection, which includes funding for personnel and surveillance technology. Johnson, giving an update on border security at the halfway point of fiscal 2015, said there were more than 150,000 apprehensions on the Southwestern border as of March, down 28 percent from the same period last year. “Thus far in FY15, up to and through March 2015, there have been 151,805 apprehensions on the southern border,” Johnson said during a briefing at Customs and Border Protection offices in Washington. Apprehensions in Arizona mirrored the rest of the border, according to statistics released Friday by the agency, which showed a 32 percent drop during the first half of the fiscal year compared to the same period a year ago. That put apprehensions in the state to the lowest point in more than 20 years. Todd Landfried, executive director of Arizona Employers for Immigration Reform, said he didn’t doubt that apprehensions are down, but he said enforcement is only part of the solution. “You have to fix the system by which people can come here legally to work,” he said. Johnson said apprehensions are down despite an improving U.S. economy, which has historically served to attract more immigrants. Johnson also touted a drop in the number of unaccompanied children arrested on the Southwest border so far this year, after a sharp rise in those numbers last summer. He credited part of the success for that drop to cooperation with governments in Mexico and Central America that has helped with enforcement but has also helped stem the numbers of people trying to cross the border by publicizing the dangers of the trip back in those countries. 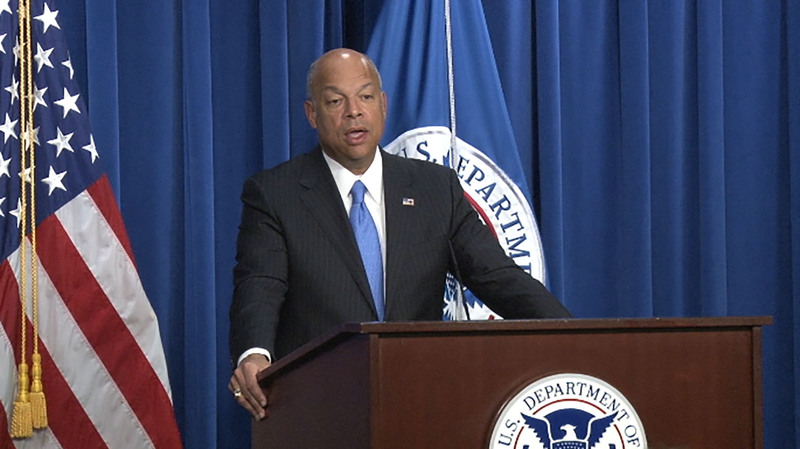 Despite the gains, Johnson said there is more to be done, including increasing the agency’s focus on human smuggling operations. “We are not declaring mission accomplished we believe there is more that we can and should do when it comes to strengthening border security,” he said. 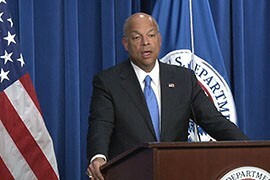 Homeland Security Secretary Jeh Johnson said that a sharp drop in apprehension of immigrants along the Southwest border shows that investments in border security are paying off.